After several months of hard work, series of trainings and local ground work, we have concluded our “Managing Diversity” project – a long term training course working with youth workers, youth trainers and educators. “Managing Diversity” involved 26 youth workers and educators from 13 different countries to develop their diversity management skills and support in learning how to implement a culture of diversity in their working environments. 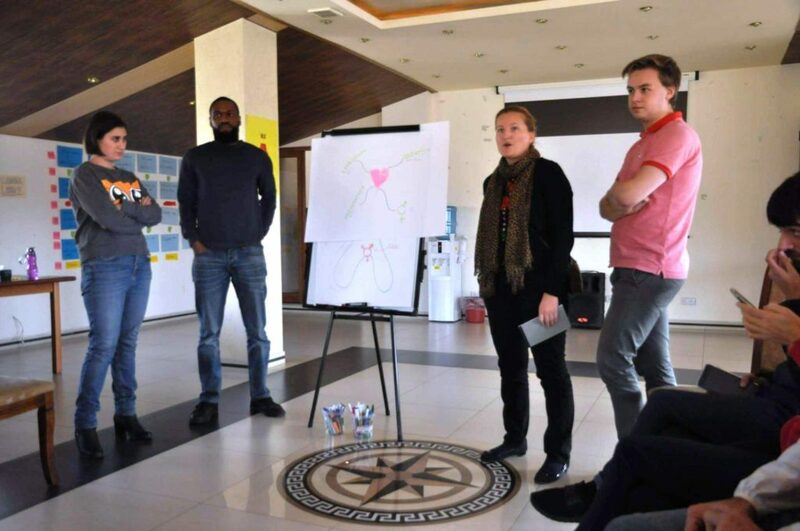 Following the Introductory Training in the Netherlands this August, participants have implemented 19 community projects back to their countries during September and, finally, traveled to Armenia in the end of October to present the impact of their projects and their learning achievements. Following the successful implementation of small projects, the project results were evaluated and presented to public during a Closing Event. The public event was attended by young people, representatives of NGO’s and international organizations, media and partners. Nelly Paytyan, the Project Coordinator from Armenian Progressive Youth NGO believes that “Managing Diversity” is a good tool to counter widespread stereotypes in our societies: “Promoting diversity matters and will matter until young people in our societies face discrimination, ignorance and life burdens based on their nationality, ethnic, cultural and religious background, social status, as well as their gender identity and sexual orientation. I believe, everyone who joined this project agrees that embracing diversity, inclusiveness, sensitivity, equity and solidarity in our daily lives and work with young people matter nowadays more than ever”. Karine Grigoryan, a trainee from Armenia, took part in all three activities of the project. Following the training in the Netherlands, she organized professional orientation activity for young people with disabilities. Karine says: “My desire of implementing this activity was based on my belief, that no matter the type of the disability, people can discover the satisfaction that often comes from realizing and using their strongest abilities and skills”. Through her project Karine targeted young people with physical disabilities and learning difficulties. As she mentions, “the activity helped the participants to understand what kind of personality and qualifications they have, what they are good at, what they enjoy and what are the possible occupations they may have in the future”. Karines project helped the participants to improve their job searching and employability skills. In particular they learned how to write CV, learned about some job searching websites which they can occasionally browse and look for a job that fits their skills and abilities”. Martijn Bergsma, the Project Coordinator from the Netherlands shared some information about how the partners and participants were chosen: “In the beginning we made an open call looking for partners who would be interested to join this project. After selecting the partners and approval of the project, we have also announced an open call for participants to make sure the project is inclusive and open for everyone involving those people who really need it”. Fabio Di Benedetto, our participant from Italy have decided to work with young emigrants back to his hometown in Sicily. Fabio organized an Intercultural day that involved 8 local youngsters and 8 unaccompanied foreign minors. There are about 15.000 unaccompanied foreign minors in Italy, one third of them living in Sicily. They come mostly from African countries and due to very weak integration policies of the Italian government, they don’t have interactions with the local youngsters. Fabio describes his experience with an excitement: “For the first time youngsters had a chance to talk to each other and get to know each other. They had various backgrounds but during the event they have found out that they are not so different”. Another participant from Romania, Maria Carbunaru implemented an improvisational theatre in Romania involving Roma children. Maria says: “The Theater included Roma kids from poor families and orphanages. They spent a day by doing improvisational theater. In the end of the day they were happy and it made me feel good”. Neel Klappe, one of the trainers from the Netherlands, thinks that it’s great that the project had concluded in Armenia. “It really makes project more powerful and impactful. I realized how you can do great things when you have a motivation. Through local projects we have realized what we can change and how many people we can reach. This makes me proud”, she says. Rodrigo from Portugal says that the whole experience gained during the project can simply be put in one word — “memorable”. Rodrigo organized a small surfing event with children with disabilities. Currently, he is trying to design a bigger project. The idea is to have a training course on personal development and social inclusion of children with disabilities. National minorities were not left out of attention as well. Carlos, from Portugal, has worked with representatives of different nationalities living in Portugal, organizing a joint football tournament. “I think I offer a space for the ethnic minorities to gain confidence and break some communication barriers helping them in their professional lives”, he says. A journalist from Moldova, Tudor Arnaut joined Valentina Botnaru from Moldova to work on a documentary movie promoting the rights of LGBTQI people. The documentary focused on the lives of LGBTQI people in Moldova and has been screened for the first time during the Closing Event in Armenia. Tudor says that during the preparation of the movie he got more information about LGBTQI people in Moldova and became more open-minded. “I had good feedback and now we want to continue with my partner, Valentina Botnaru, doing more beautiful documentaries. «Managing Diversity» was an eye-opening experience and now we are more self-confident to move forward with our ideas”, he says. “Managing Diversity” was organized by Armenian Progressive Youth NGO (Armenia) and Jongeren voor Uitwisseling en Begrip (The Netherlands). The project was granted by the Dutch National Agency under the Erasmus Programme of the European Union. November 14, 2017, could be an average day for the many young people, but the day was unique for Arpi and Varuzhan. That day the youth workers used the gained skills to transfer their knowledge to the counterparts. The topic was «Media un-coverage of different genders». 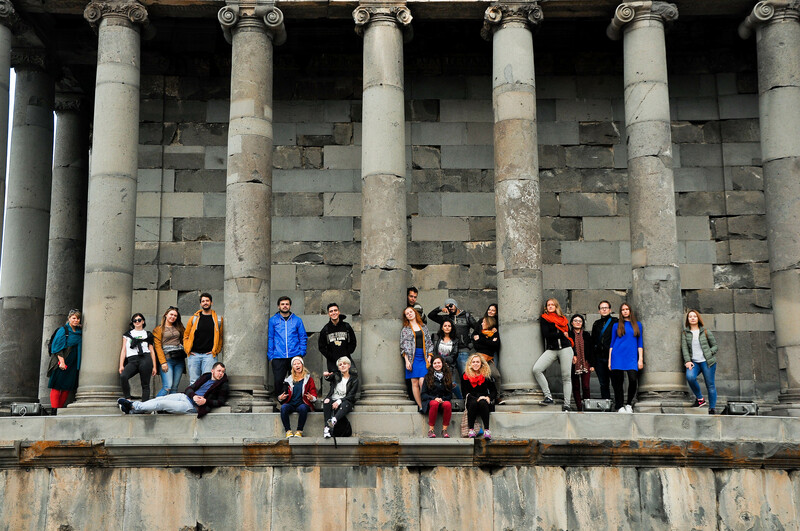 Arpi and Varuzhan organized the session for an international group of youth workers hosted in Armenia. The facilitators used theater as a learning method. The participants were divided into 4 groups. Each of the groups had one fact about gender equality issues in the Media. All of the groups prepared and presented a small sketch answering why gender inequality appeared in real life. The participants presented very diverse and interesting sketches. After the performances, a panel discussion was done with the group. The process was new and interesting not only for the participants but also for the facilitators. Arpi and Varuzhan were using the skills gained during the project «Using Media as a tool for gender equality promotion»(Vienna, October 2017) for the first time. «That is a unique experience when you share your knowledge and skills with other people, it also helps you to re-evaluate the attitude you have towards the topic»,-said Arpi, who was one of the facilitators. Arpi used the gained skills as a participant of the project «Using Media as a tool for gender equality promotion». 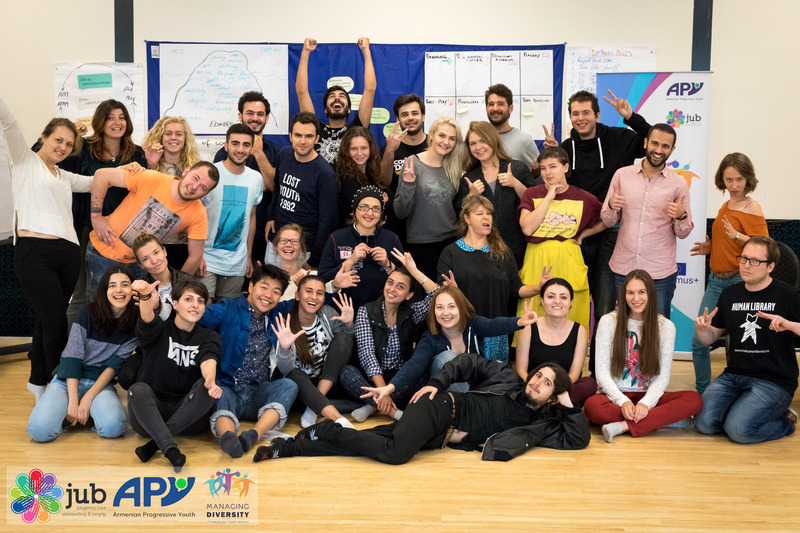 The main aim of this Training Course in Vienna was to increase awareness and provide youth with proper knowledge about gender issues and perspectives of European and project countries media. 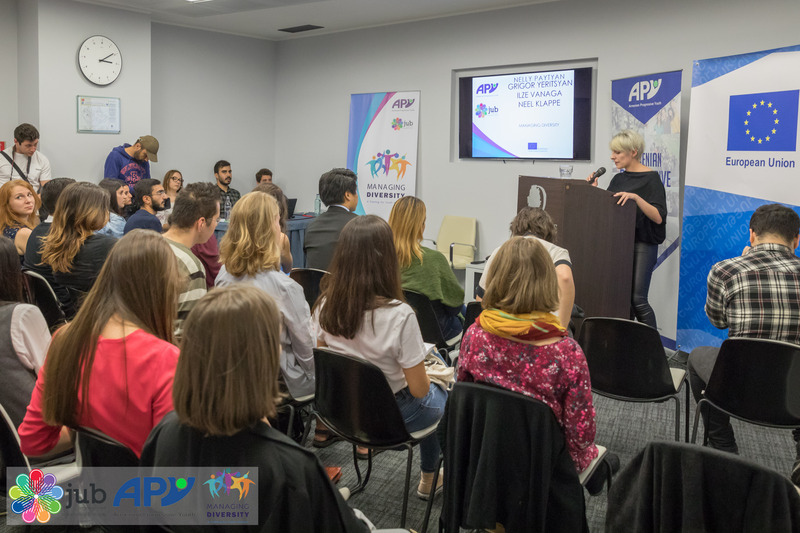 After the official ending of the session, Arpi and Varuzhan shared with the youth workers from different parts of Europe about the project they participated in Austria and informed the present ones about the opportunities Erasmus+ gives to youth workers.